Institutions can created a custom FAQ section for faculty and administrators. 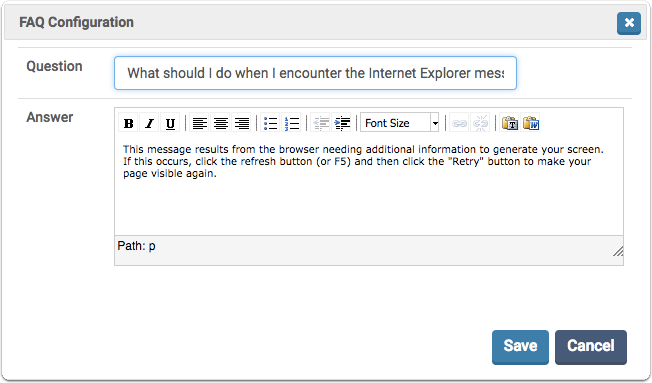 Interfolio has established some common questions/answers that you can add to, delete, or modify. Faculty and administrators can access the FAQs from the Dashboard. Faculty members have the ability to ask questions, which in turn will be added to the FAQ section upon being answered by a level 1 university software administrator. 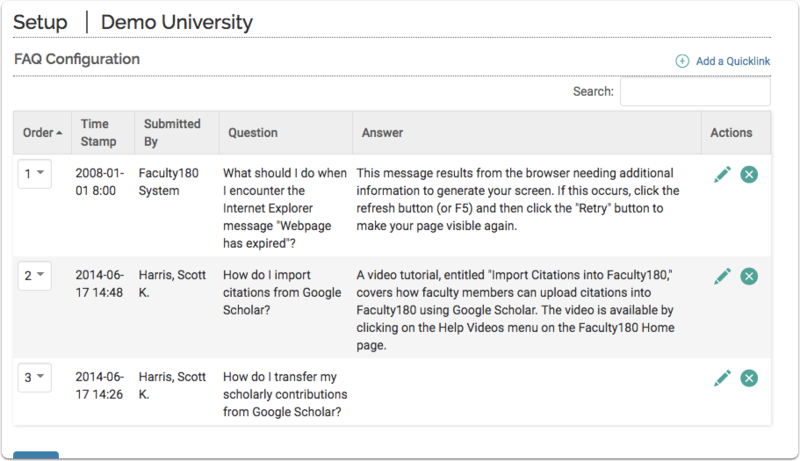 Faculty can submit questions by clicking Announcement and Help from the Navigation Bar. When a question is submitted, all level 1 university software administrators receive an e-mail message with a link to the question. The link also displays in the To Do section on the level 1 administrators' Dashboard. When a level 1 university software administrator answers the question, the faculty member who submitted the question receives a notification that the question has been answered, the question and answer are added to the FAQ section, and the links are removed from the Dashboard for the other level 1 university administrators. However, the level 1 university administrators do not receive notification that the question has been answered. Institutions can request that the names of FACULTY180 users who submit questions in the FAQ section be hidden - please submit your request to your CSM. Click FAQ Configuration in the Configuration section. The FAQ Configuration screen displays. If you wish to make changes to current FAQ content, click the appropriate Edit icon. To add a new FAQ, click Add. Add the new question and answer. Use the Order column's drop-down field to change the order of the FAQs.